Snow globes are very collectible items and, over the years, they can lose water, or sometimes the water becomes clouded with dust or algae. If your snow globe has a plug on the bottom, changing the water in a snow globe is relatively easy. With the proper tools and a steady hand, it can easily be done in an hour. Create a work place on a flat surface by spreading out old towels. Create a doughnut shape with a hand towel, secure with a clamp and place in the middle of the work area. This towel will hold your snow globe and keep it from moving as you change the water. Remove the plug from the bottom of the snow globe as gently as possible. Some snow globes have plugs that are glued. This requires a little force. Place the glass part of the snow globe into the doughnut-shaped towel. Be sure that the towel is tight enough to hold the snow globe so that it doesn’t slip or move and adjust the clamp on the towel appropriately. Allow the snow globe to sit for five to 10 minutes or until all the snow and glitter has settled at the top of the glass in the snow globe. Use a turkey baster or suction device to remove the water from the snow globe and discard in the sink. You will fill up the baster several times to remove all the water. When there is only enough water to barely cover the glitter and snow at the bottom, stop. Use an eye dropper to place enough rubbing alcohol to cover the glitter. Gently grab the globe and swish the alcohol around and remove the alcohol using the turkey baster until all that is left is glitter and snow. Place distilled water in a clean glass making a half-and-half concoction or water and alcohol. Use the turkey baster to place the mixture back into your snow globe. Place the plug back in the globe by gluing or screwing it in place. 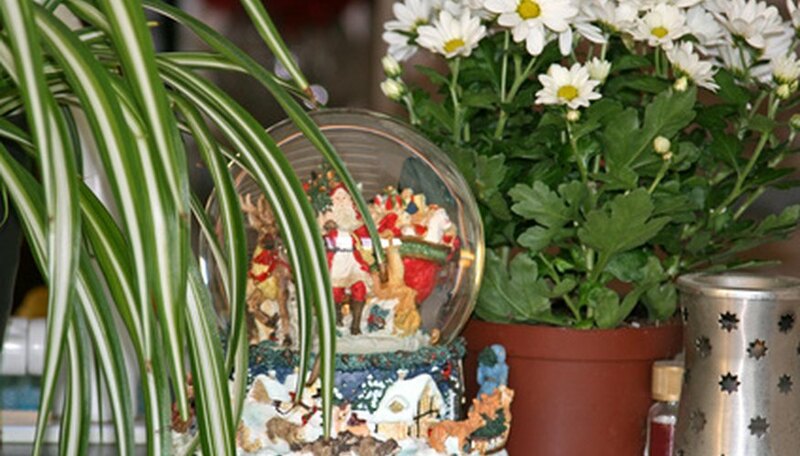 If your snow globe is sealed, take it to a professional restorer to remove any algae buildup or repair water loss. Keep your snow globe at room temperature and away from direct sunlight to prevent water loss and algae growth.